• With all that’s been going on at my own Christian college, I haven’t had the bandwidth to write about Azusa Pacific University — which changed its behavior standards for LBGT students… then changed them back again after a conservative outcry. • So why do such schools have a hard time changing? Adam Laats saw APU as repeating an old story in the history of evangelical higher education. • I had the pleasure to sit with our opening speaker, Peggy Bendroth, at the CFH banquet last night. Not long ago she wrote about the unexpected benefits of institutional religion. • Is the Republican Party at risk of losing the votes of a key constituency in the Age of Trump? • Do we think of Christian Zionism as an interfaith movement? • For a very different view of masculinity than what Kristin studies… I looked more closely at how my favorite hymn writer wrote about God. 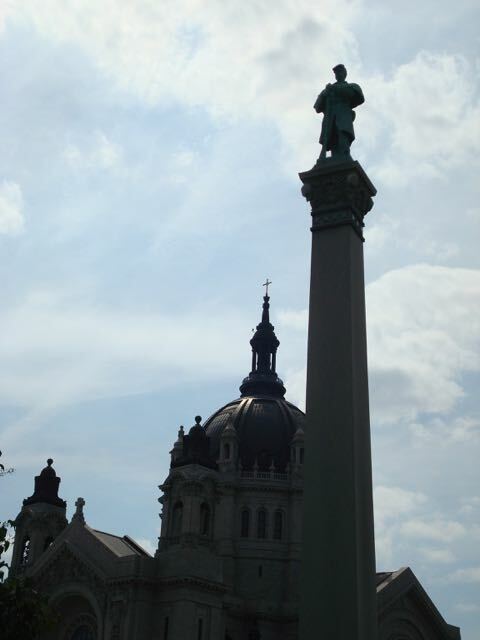 • Debates over Civil War memorials aren’t confined to the former Confederacy: a statue of a Civil War veteran in St. Paul, Minnesota is drawing criticism from Native American activists. • Did you hear? I’m taking a group of adults to Europe next June for an eleven-day world wars tour. • This week I submitted a proposal for a new course on the history and politics of sports. Which will make it all the easier for me to justify spending time reading articles like this one on the history of baseball cards.